Nowadays bathrooms are not boring, just functional rooms, containing just a flush toilet or kept away from the main area of the home. 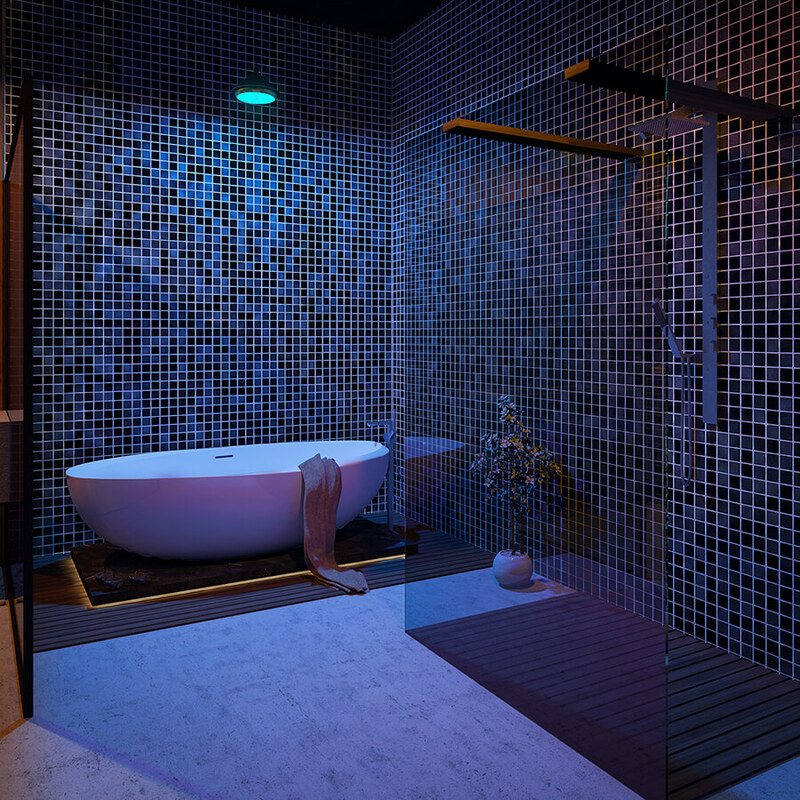 For many years now, bathrooms have combined strongly with the house, and they are come to stay! Currently, bathrooms are larger and better than ever in their history. Now, they are a space for easing, luxury, and pleasure. Blue is the standard bathroom color, reminds of the sky and sea. Blue, the color of serenity, relaxes and motivates self-confidence and hope. As a traditional dye for bathrooms, blue can be used as the main color with many other Auxiliary colors. On the color palette, blue has different shades from aqua to purple, offers you a wide variety of potentials. Light blue increases space and have a soothing, light effect; while dark blue shades like what we used in this project feel reliable and cozy. As you can see in the architectural rendering outcomes, we combined the main blue color with warm shades of natural wood to create an attractive and smooth contrast in the space. Because the bathtub is the most used fixture in the bathroom, it is important for us to choose one that our client will like. We wanted to add a little luxury to this bathroom, so we chose a freestanding bathtub. This tub can truly make the bathroom look exclusive and stylish. Though a freestanding bathtub takes up more space than a built-in one, it still provides a lot of advantages like Flexibility in design and Distinct and unique style. 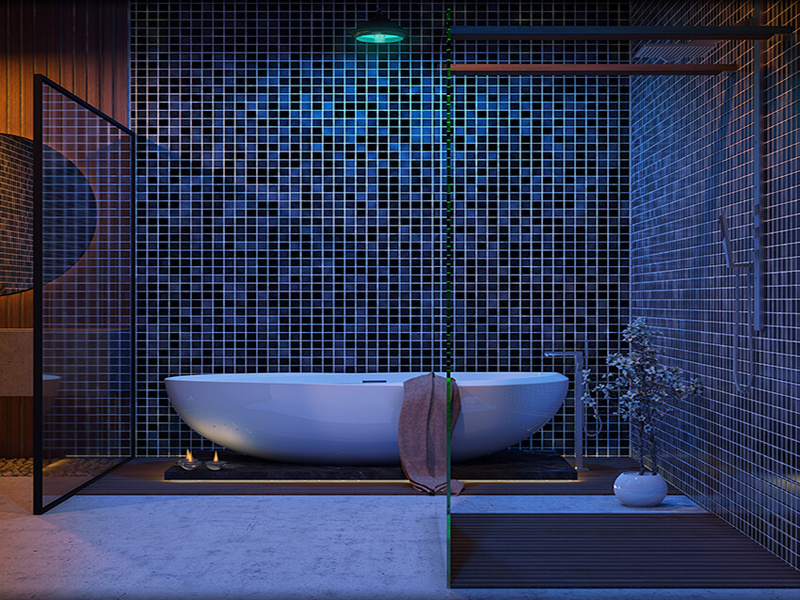 The pendant light with light blue color emphasis the unique color of the ceramic tiles of the bathroom. The clever use of a large round mirror and glass partitions instead of rigid walls makes the bathroom seem so much roomier. The built-in shelf on the side wall free up more space on the room and enhances this effect by glass walls. 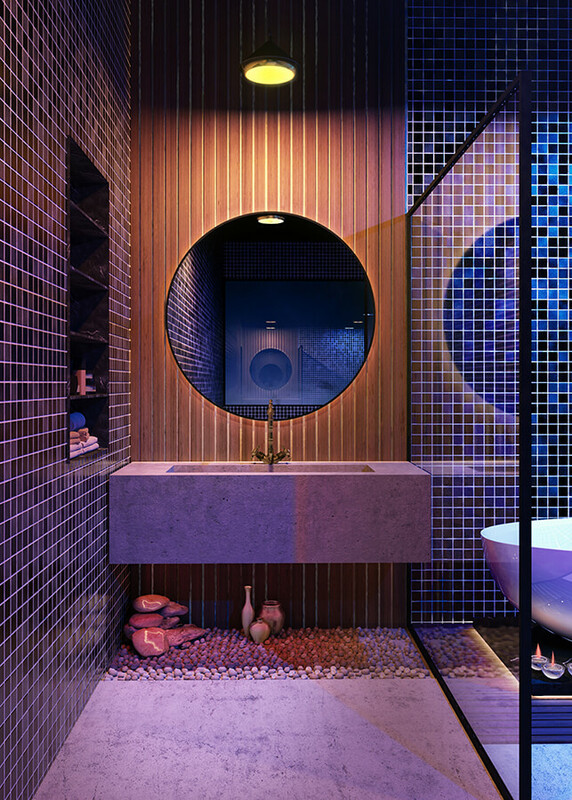 The tiny square-cut dark blue ceramic tiles have a varied and exciting blue hue that makes them seem more valuable. United with the warm brown natural wooden tiles on the wall and a unique concrete wash basin, this bathroom is a faultless symbol of cool and warm combination while also being modern and cozy at the same time.